Length 10.20", Width 6.60", Height 8.30" (Total Height 8.40"), F15 terminals (Terminal hardware included), Approx Weight 192 lbs. RBC13 Product is a Special Order item and can be purchased by Telephone Order Please call (408)924-0800 for further details. 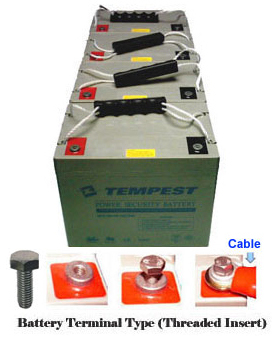 Guaranteed to meet or exceed APC RBC13 Cartridge Batteries specifications and performance. All RBC13 Cartridge Batteries are new. We do not sell refurbished batteries.